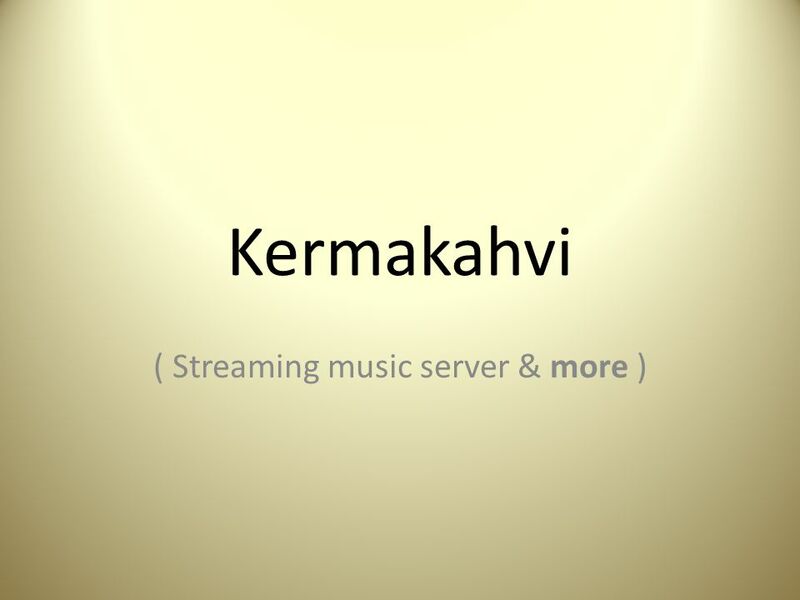 Kermakahvi ( Streaming music server & more ). Goals Original goal was to install VDR ( Video Disk Recorder) Since we managed to break the DVB-T stick. 2 Goals Original goal was to install VDR ( Video Disk Recorder) Since we managed to break the DVB-T stick in the middle of the project, we had to come up with a new goal. Installing GNUMP3d was chosen as the next goal. 3 Installing CentOS We installed CentOS 5 as instructed. 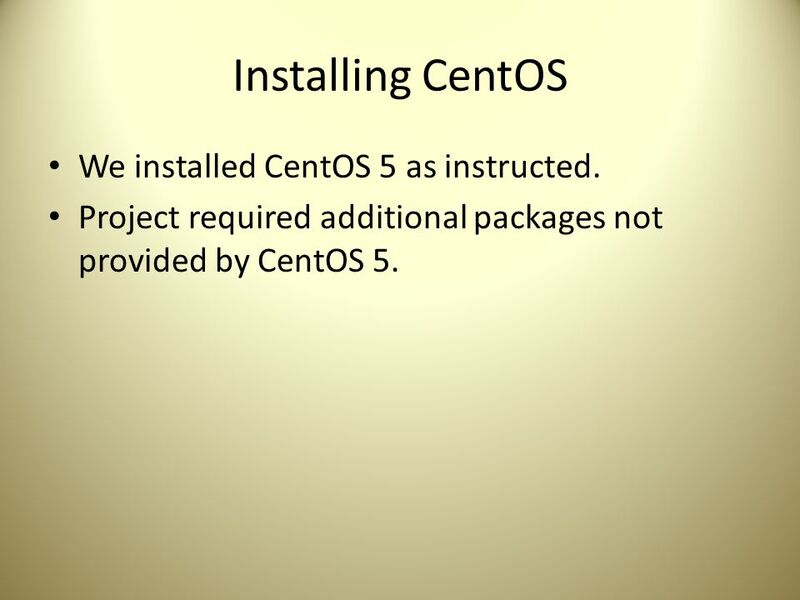 Project required additional packages not provided by CentOS 5. 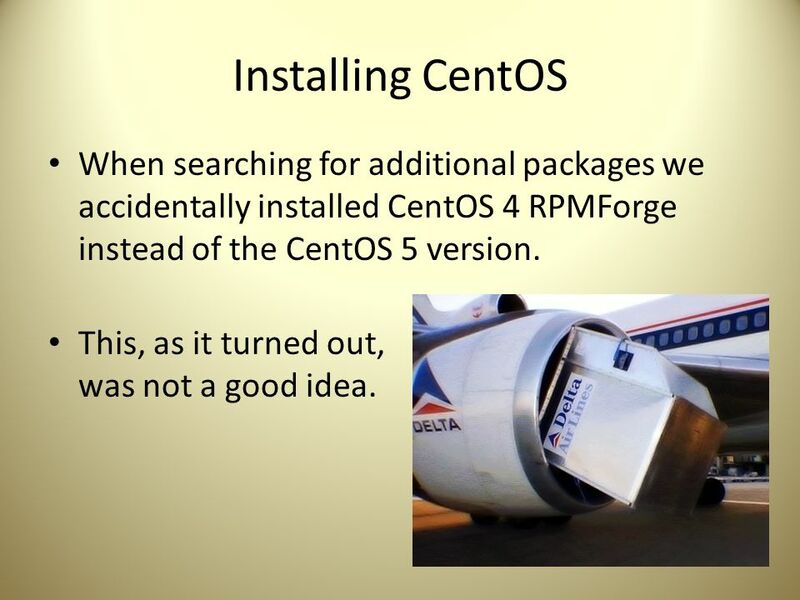 4 Installing CentOS When searching for additional packages we accidentally installed CentOS 4 RPMForge instead of the CentOS 5 version. This, as it turned out, was not a good idea. 5 Installing CentOS, again. 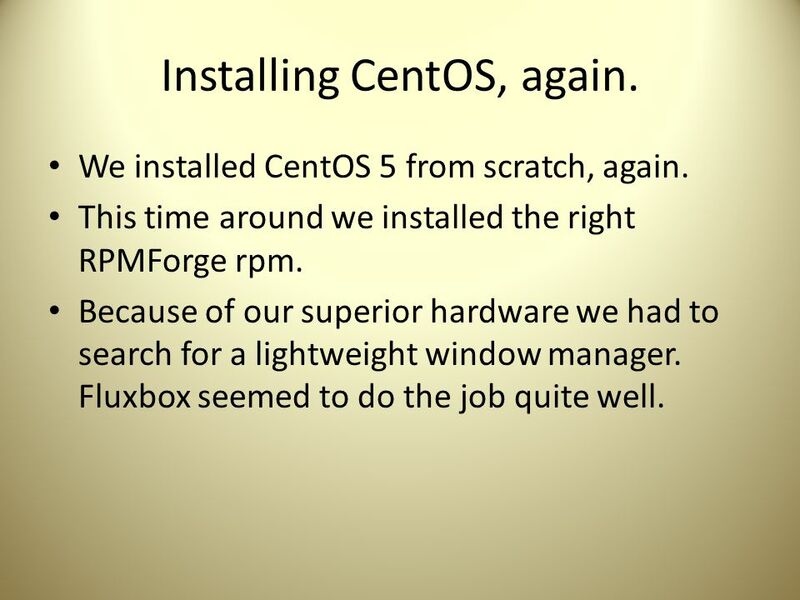 We installed CentOS 5 from scratch, again. This time around we installed the right RPMForge rpm. Because of our superior hardware we had to search for a lightweight window manager. 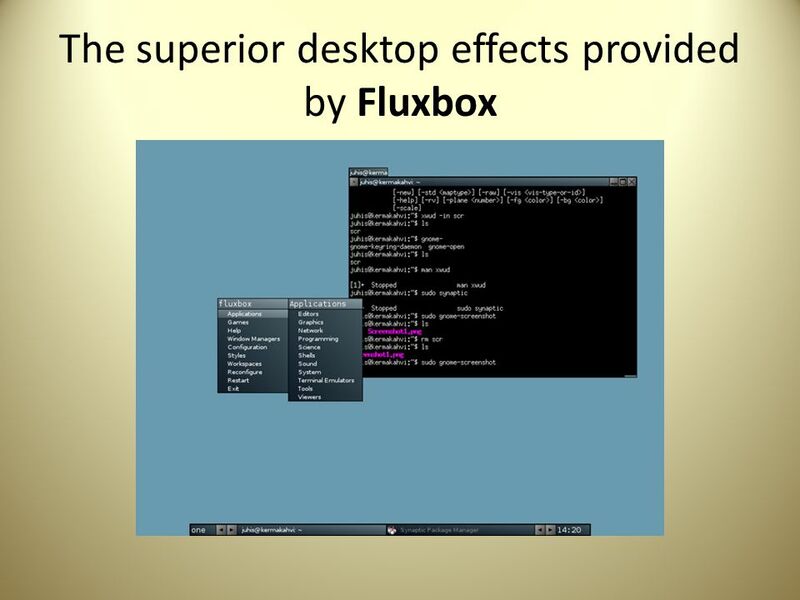 Fluxbox seemed to do the job quite well. 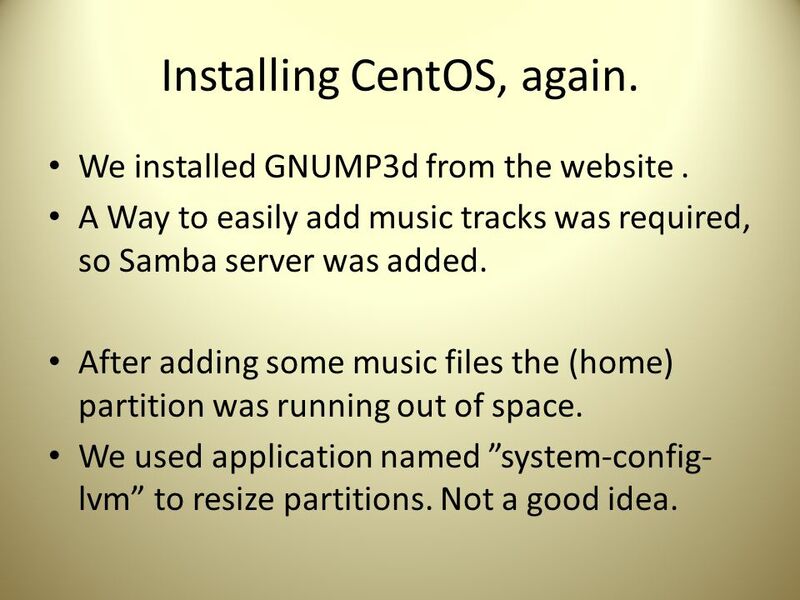 7 Installing CentOS, again. 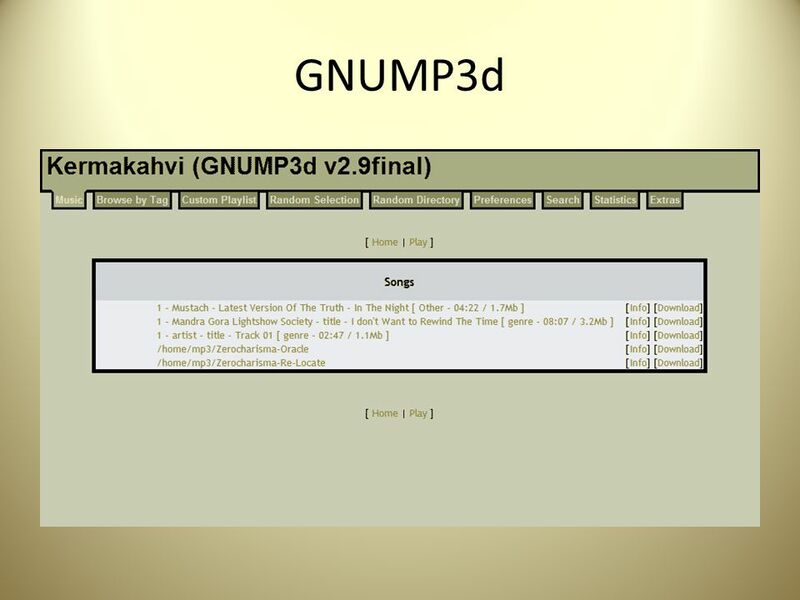 We installed GNUMP3d from the website. A Way to easily add music tracks was required, so Samba server was added. After adding some music files the (home) partition was running out of space. We used application named ”system-config- lvm” to resize partitions. Not a good idea. 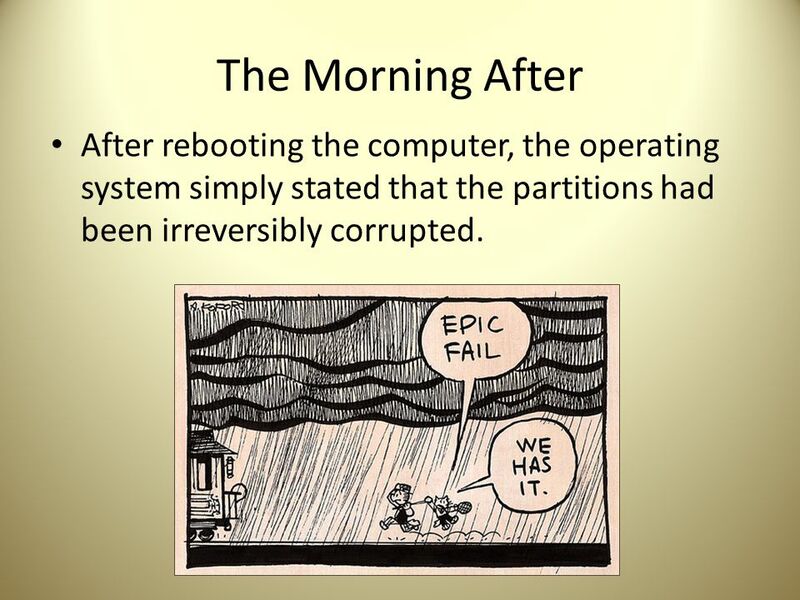 8 The Morning After After rebooting the computer, the operating system simply stated that the partitions had been irreversibly corrupted. 9 Installing Debian Instead of installing CentOS again, we opted for much better alternative: Debian. 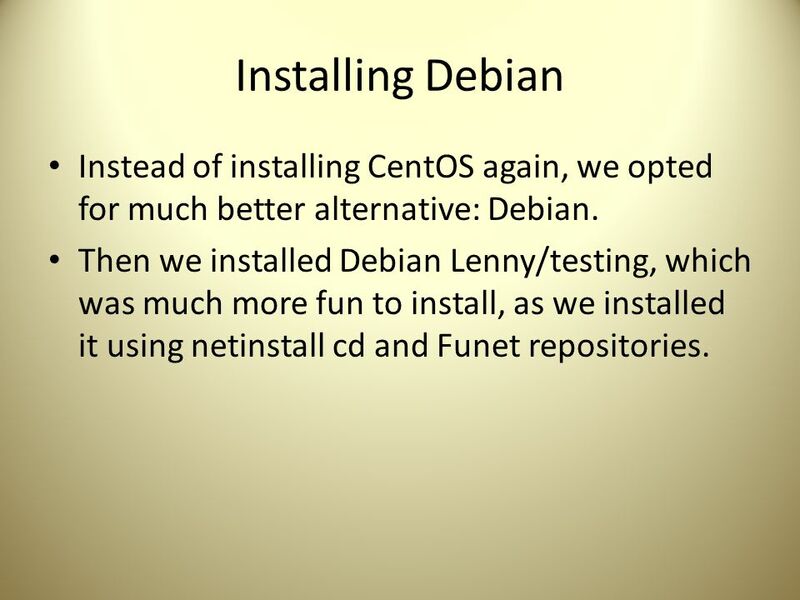 Then we installed Debian Lenny/testing, which was much more fun to install, as we installed it using netinstall cd and Funet repositories. 10 Installing more software First we added some users and installed openSSH to enable remote login. 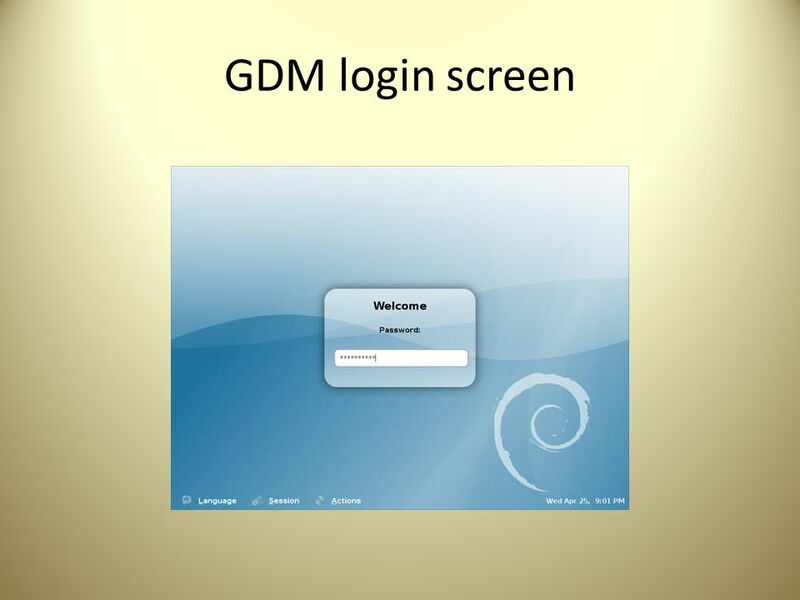 Then we decided that we want graphical login and installed X server (x.org) and fluxbox window manager and gdm. 12 Music server We added a new user called mp3 to have a special user for storing and using the music. We installed Gnump3d from Debian repositories and configured it to run as mp3- user and use the users directory as music directory. 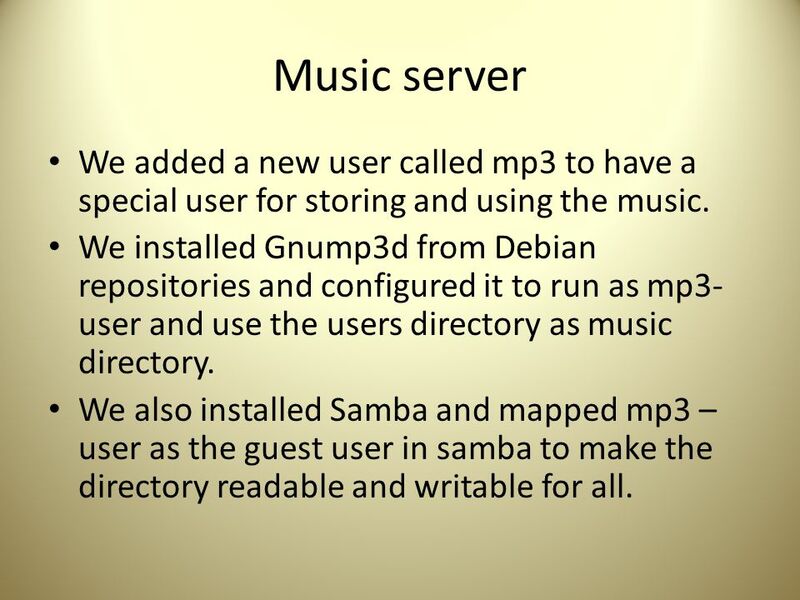 We also installed Samba and mapped mp3 – user as the guest user in samba to make the directory readable and writable for all. 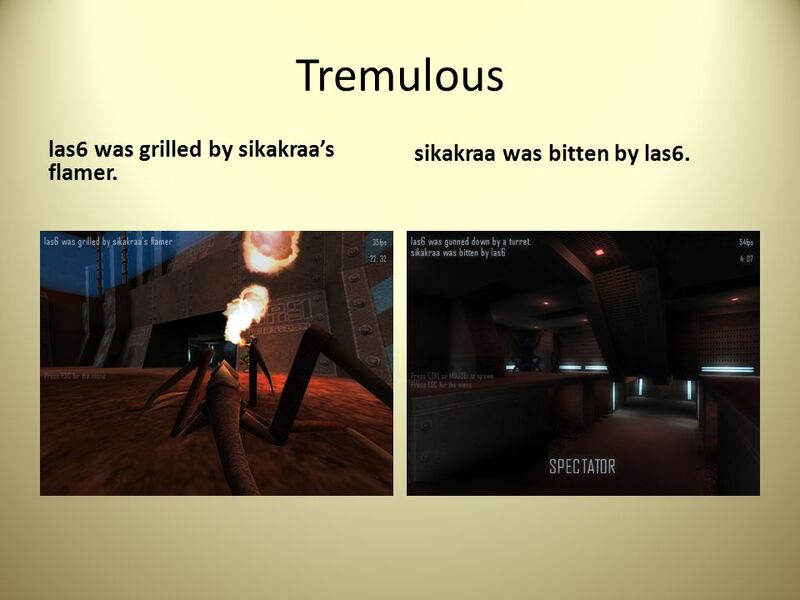 15 Tremulous las6 was grilled by sikakraa’s flamer. sikakraa was bitten by las6. 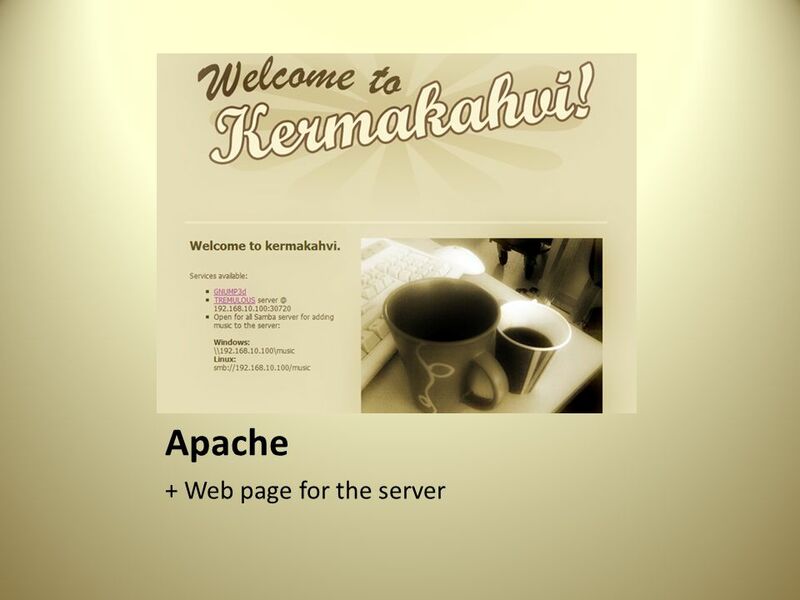 Download ppt "Kermakahvi ( Streaming music server & more ). 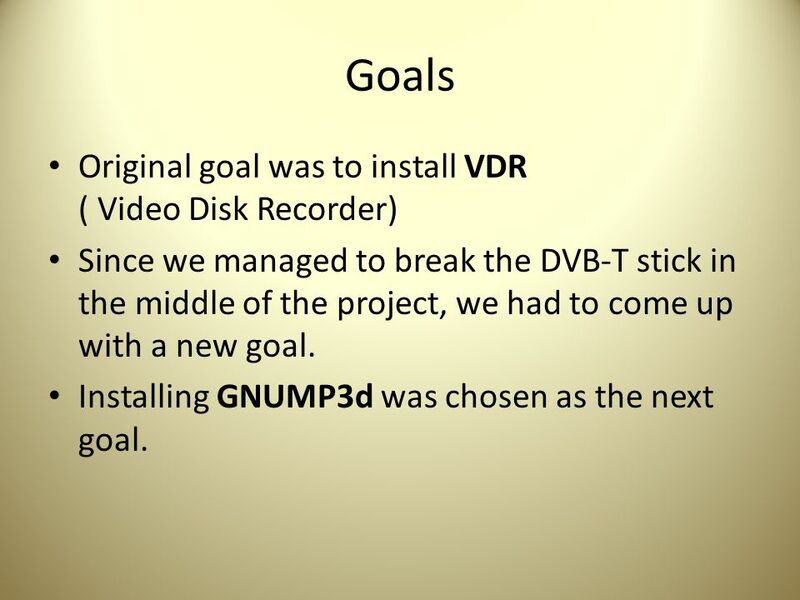 Goals Original goal was to install VDR ( Video Disk Recorder) Since we managed to break the DVB-T stick." 1 Institutional Repository Workshop 1 – 3 April 2009 Presented by Leonard Daniels. Installation of Ubuntu on a Virtual machine. VirtualBox allows you to run an entire operating system inside another operating system. Please be aware. Voice Server. Aspiration Provide a unique service to the members of CCSU. Provide a unique service to the members of CCSU. Provide a Streaming Voice Server. INSTALLING LINUX.  Identify the proper Hardware  Methods for installing Linux  Determine a purpose for the Linux Machine  Linux File Systems  Linux. Windows 2003 Server. Windows 2003 Server Contents Fitur Windows 2003 Server Installation And Configuration Windows Management Resource  User Management. Microsoft Windows Server 2008 Software Deployment Chris Rutherford EKU Technology: CEN/CET. Get android development environment running. Install – Get and install JDK 5 or 6 (see link in the. Lesson 15 – INSTALL AND SET UP NETWARE 5.1. Understanding NetWare 5.1 Preparing for installation Installing NetWare 5.1 Configuring NetWare 5.1 client. Lesson 5-Accessing Networks. Overview Introduction to Windows XP Professional. Introduction to Novell Client. Introduction to Red Hat Linux workstation. Presented by Mina Haratiannezhadi 1.  publishing, editing and modifying content  maintenance  central interface  manage workflows 2. Installing Linux Redhat: A how to guide in installing and configuring Redhat 6.2. PacNOG 6: Nadi, Fiji Installing Ubuntu Server 9.04 Hervey Allen Network Startup Resource Center. Configuring Apache tomcat Specifying the server port NOTE: Edit the install_dir/conf/server.xml and change the port attribute of the connector element. 70-290: MCSE Guide to Managing a Microsoft Windows Server 2003 Environment, Enhanced Chapter 12: Managing and Implementing Backups and Disaster Recovery.